I had never seen ANYONE record a 2 minute piano solo and then DOUBLE IT EXACTLY without missing a note...except for the time I saw Powell do it during the 1991 sessions. And the action on his favorite piano was HEAVY. You had to have STRONG fingers to depress those keys. When it's all said & done, no one played like B.P. His style was unmistakable and that's what counts. Style. Billy was amazing. I'm quite sure Billy objected to him being excluded at times (by Kooper). But you have to understand...Billy played on EVERYthing and he played on EVERYthing ALL THE TIME. He never laid OUT one single bar. So, in the studio, you'd have to do some pick-and-choosing. First of all, I have a misunderstood reputation amongst band members for being cold-hearted. Yeah...ME! You need to understand that first so that you may see the humor in this. In 1990 we were recording a demo for MCA in Muscle Shoals. All of us were together trying to arrange this tune and Billy said "I already hear my piano part." Jokingly, I said "Oh Billy...we'll get to that...don't you know that Skynyrd is a guitar band?!" Billy jumped up and got in my face. "Wait a minute, WAIT a minute!, everybody! I've got something to say!!" Then he started venting about all of the classically inspired instrumental pieces he'd written over the past few years...stuff we'd never heard. Billy said "This music is so inspiring it'd make you guys cry. Well ... all except for YOU, Ed." ALL of us to a MAN fell on the floor laughing hysterically. It was the PURE BILLY MOMENT! Q - Did Billy always tote his piano around even in the earliest of days when they were doing the club circuit? During the club days, Billy only used a Wurlitzer electric piano...the same one that you hear on his solo on WORKIN FOR MCA (from Second Helping). It wasn't until our first album came out that we were able to carry around a real piano and a Hammond B3. Q - Does a piano hold it's tuning well after getting shuffled in and out of vans from town to town? This is a Billy Powell original that I just dug out of my files. Billy drew this up over the course of an entire tour...either '93 or '94. Billy has a friend. He may be real or imaginary - we never really knew for sure - his name is Jimmy. Jimmy's dialect (as spoken by Billy) is a peculiar, redneck Southern drawl...and Jimmy likes to fight. All the time. This is a food menu for an imaginary restaurant conjured up in Billy Powell's mind. I think this is one of the funniest things I have ever seen in my life. A real serious insight into the mind of Billy Powell. I love this. I hope I don't get in trouble for posting it! Q - Ed, you mentioned you visited B.P. twice in rehab. What was his reaction? Billy was always glad to see me and vice versa. But I always CALL before visiting. Like Elaine & Jerry, I HATE THE POP-IN! I'm bummed out...funny how I am more bummed out about BP than I was about Leon, even though I really loved Leon like a brother. BP I was less familiar with. The last time I saw him was when he was in rehab about 7 miles from my house in 2006 - went up there twice to see him. 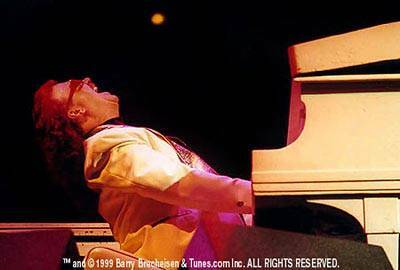 Yes, one great piano player...you hear a BP solo, you know it's HIM. May BP rest in peace. I think of him every day. Billy didn't listen to music in the house. His tinnitus was unbearable so much of the time, so no surround sound, at home. Not even for the tv's. His music listening took place in the cars. And, big, big Billy Joel fan. He also enjoyed Stone Temple Pilots (thought Scott Weiland's voice very versatile, liked the balls of their music, loved "Vasoline"), Bonnie Raitt (esp. the albums "Bonnie Raitt" and "Nick of Time"), Jeff Beck ("he's an incredible guitar player...and he'll tell you so, too! "), CSNY, Little Feat, The Doors, The Beatles, The Who. KD Lang's voice was one he admired a lot. "Absolute Torch and Twang" was in the rotation quite a bit. And, he really liked Dale Krant-Rossington's voice. He loved it when she let those pipes loose in the '80's. He always wanted for her to take lead singing duties as a part of the show after Skynyrd re-formed. He'd mention it year after year. Whether he did to the band, I don't know. 15-20 minutes or so a gig, is what he wished for. Not only did he want to hear her belt 'em out again, but he wanted to play backing her vocals. And he thought it'd be good for JVZ's voice to take a break halfway thru. At home, when he'd play classically, he would often play Liszt and Chopin. Other well known composers, too, but they were most heard when he'd open the window above the river and play.